Hailey Lien, of Chadron, right, answers questions from judges during Western District History Day at Chadron State College Friday, March 1, 2019. Chadron residents Donna and Gary Beiganski talk with Hadlee Rudloff of Crawford, winner of the Military History Special Award, during Western District History Day at Chadron State College Friday, March 1, 2019. 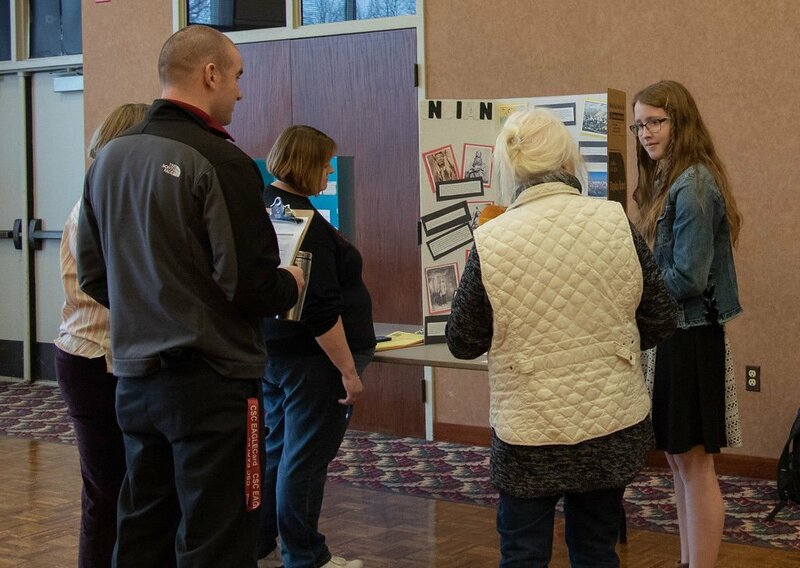 Kamden Victory, of Crawford, right, explains her exhibit to a visitor during Western District History Day at Chadron State College Friday, March 1, 2019. Cambrea Vogel of Crawford High School portrays a women with polio in "I Can..." in Chadron State College's Memorial Hall during Western District History Day Friday, March 1, 2019. Kylah Vogel of Crawford High School portrays Hannah Senesh, a paratrooper who rescued Jews during WWII, in Chadron State College's Memorial Hall during Western District History Day Friday, March 1, 2019. Students from Chadron, Crawford and Sioux County middle and high schools participated in the annual Western District History Day at Chadron State College Friday, March 1. The theme for the competition was “Triumph and Tragedy.” The top three students/teams in each age division and category will advance to the state competition April 6 in Lincoln. The judges reserved the right to not award first place to entries.